A 14-mile light rail line is part of Triangle Transit's proposal for Wake County. Commissioners in Wake County are holding their first public discussion about a plan for expanded bus and light rail services. The board meets Tuesday morning with three transit experts from outside the state. It's the county's first public meeting about the plan, which Triangle Transit Authority presented in 2011. Commissioners have declined to bring it up for discussion since then. Commissioner Paul Coble says he wants a second opinion. "If you're going to create a plan, I would think that you would go to experts, perhaps outside of the area, to get a clean and fresh look, because sometimes you can be too close to the issue to see what the options are," Coble says. Some other commissioners and advocates of the transit plan say the meeting is a tactic to delay it further. Commissioner Betty Lou Ward says it deserves serious consideration. "If you look at how we have grown in Wake County, it's obvious that we do need transit. Light rail mixed with buses, I think from an economic development standpoint, are very much things that help regions thrive," Ward says. Voters in Durham and Orange counties have approved a half-cent sales tax that will help pay for buses and a light rail line from Chapel Hill to Durham. Wake County commissioners have refused to put it on the ballot. A Raleigh task force has recommended a $300 million light rail route for the downtown area. It's part of a proposal from Triangle Transit Authority to complete commuter train and light rail systems from Orange to Wake Counties by 2025. Eric Lamb is Raleigh's transportation planning director. He says the proposed route leaves the existing tracks at Morgan Street and splits into two tracks that wrap around the Capitol Building at Wilmington and Salisbury Streets. The Raleigh City Council has approved a proposal for a downtown light rail line. City council members voted last night to support a route that goes through the west side of downtown along Harrington Avenue. 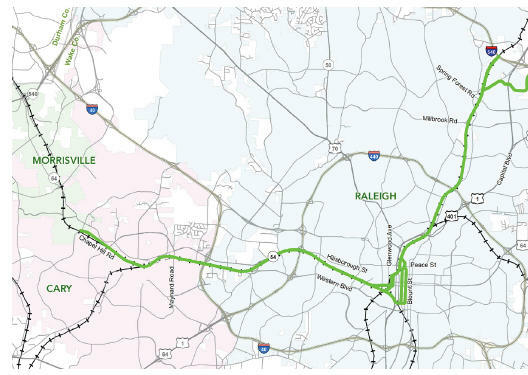 It's a segment of the light rail proposal from Triangle Transit Authority that would eventually run from Chapel Hill to Garner. The council's plan breaks from a recommendation by the city's Passenger Rail Task Force. That route would have brought tracks into the heart of downtown on both sides of the Capitol building. Orange County Commissioners have given final approval to levy a half-cent sales tax for transit projects starting this Spring. Commissioners decided this week to collect the tax beginning on April 1. Voters in Orange County approved the tax on a ballot referendum in November. Durham residents did the same last year and will start paying the tax at the same time. Revenue goes toward a $1.4 billion plan from Triangle Transit Authority to expand bus services and build a light rail line from UNC Hospitals to downtown Durham.